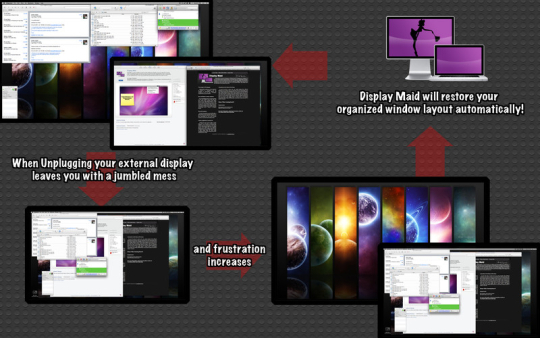 Display Maid is an app for keeping your displays tidy and managing your workspaces. If you use a laptop with an external monitor you probably know how frustrating it is trying to keep apps and windows organized when you have to unplug your display. Everything gets jumbled up on your main screen and when you plug your display back in you have to manually move all of your windows back over to your external display. 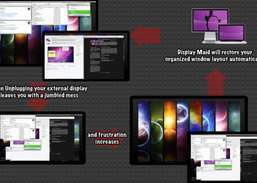 With Display Maid you wont have to worry about it any more.The concept of WorkspacesDisplay Maid considers any one arrangement of monitors as a "Workspace". Any new workspace is automatically detected and recorded. So once you have a Workspace recorded what can you do with it?Save and Restore window positionsYou can tell Display Maid to save the positions of your open windows across many apps and later restore those positions when things become a mess. With Display Maid you don't have to restore windows on at a time, or even one app at a time. Display Maid restores all saved window positions across all apps with one command. It will also restore window positions automatically when it detects a workspace change.Network LocationsYou have one monitor on your office desk, a different one at home, and none when you're on the road. These three different workspaces can also automatically set your saved network locations so you don't have to bother with it.Custom Applications Launch ListPerhaps you want one set of Apps to launch when you're at work with an external monitor plugged in, and a second set to launch when you're on the road and limited to your built in monitor. With Display Maid this is possible! Simply attach a list of apps to your different Workspaces and then set Display Maid to open at login. Display Maid will detect which workspace you're currently using and launch the appropriate list of Apps. Allows you to effortlessly resize windows to exactly half your desktop.